Baking soda for kidney health and longevity? This is definitely a catchy one. But if you think about it from a scientific point of view, it totally makes sense. The fact is our bodies are constantly neutralizing acid. This is absolutely essential as all the cells of our body need to be in a slightly basic environment in order to function properly. Without this, our cells age quicker and die quicker, and this can predispose us to many diseases. The main substance responsible for neutralizing acid is bicarbonate and the primary organs responsible for its production are the kidneys. It is estimated that about half a pound of bicarbonate is produced by the kidneys per day to neutralize all excessive acid. Unfortunately, this system can be overwhelmed and the primary culprits are diabetes, kidney disease, a high protein diet and acidic drinks like pop. High protein intake is healthy for our muscles and to keep our weight down, but because it produces excessive acid, this acid must be neutralized by a high intake of green leafy vegetables or by sodium bicarbonate. When these acids pass thought the kidney, they are attached to bicarbonate to form a neutral salt which can easily pass in the urine without damaging the kidneys. If there is insufficient bicarbonate, these acids are in their toxic form ,and when passing thought the kidneys they cause excessive damage. This can cause further deterioration of kidney function and thus even a lesser capacity to form bicarbonate. 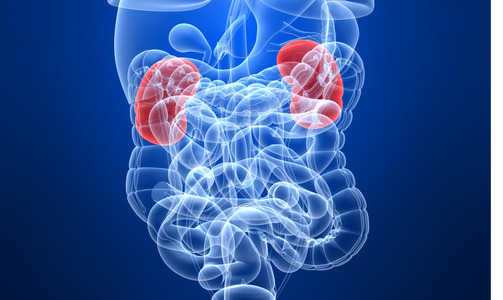 Taking bicarbonate daily in a form of baking soda is not only good for helping the kidneys with its role as the acid neutralizer, but also in disease states where the kidneys are no longer capable of performing this role on their own. Categories: Immunity, Natural Products, Radical Remedies, by Dr. Karol | Tags: baking soda, kidney health | Permalink.